Late at night in the middle of June, on a leafy residential street in Minneapolis, Hayling Han was awoken by an odd popping noise. She told her husband Heap that it sounded like firecrackers. Shortly before 1 a.m. that night, the sensors on the couple’s motion-activated surveillance camera also detected that something was happening. The camera system began to record. The site outside was bizarre, to say the least. A plume of fire was rising from the interior of the couple’s SUV and venting through the sunroof, as if their brand new Toyota had turned into a chimney. Heap, a computer engineer who runs a photography business on the side, says the couple had long dreamed of owning a car equipped for off-roading and camping adventures. 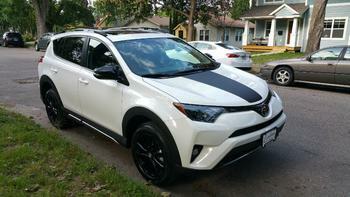 The Hans decided that the Toyota RAV4, a compact SUV, was the best car for that in their budget. The 2018 version can tow up to 3,500 pounds, more than enough to carry their inflatable motor boat to campgrounds and lakes. The Hans saved enough so that they could pay for the car in full. They bought it with cash this past May. Shortly after the purchase, they went to a popular local towing mechanic to get a hitch installed. “Nobody buys their hitches from the manufacturer because it’s so expensive,” Heap tells ConsumerAffairs. Just three weeks later, in the middle of the night, the new purchase now appeared to be spontaneously combusting. The car wasn’t even turned on; the Hans last used it for an errand the previous morning. Surveillance footage from twenty minutes prior to the fire shows Hayling with the family dog on the front lawn. The SUV is behind them, parked, turned off, and empty. This model comes with smart keys and a push-button start, but still, it won’t turn on unless the brakes are depressed. "I had the original keys, both of them, inside my house,” Heap adds. The Minneapolis Fire Department responded to the couple’s 911 call shortly after. Crews were laying down a hose line when, with little warning, an explosion suddenly rippled through the street. It came from the rear driver’s side door, where a firefighter was preparing to put out the blaze. The explosion knocked him to the ground. By the time Minneapolis Fire Department Lieutenant Larry Oker arrived on the scene later that night, crews had taken control and put out the fire, though not without significant damage. The firefighter who was knocked over by the blast suffered burn injuries on his face and hands. And the explosion sent flaming debris in all directions. Across the street, the debris landed on and ignited the hull of the Hans’ boat, destroying its motor. Nearby, the company truck that Hayling, a sales representative for the Clorox Company, used for work had also caught on fire. And a neighbor’s Jeep was damaged by what Oker described as “radiant heat” from the blast. “The farthest piece of blast debris was located approximately fifty-one feet from the vehicle,” wrote Oker in the subsequent investigative report he prepared. ConsumerAffairs obtained a copy of the report. His report concludes that the fire ignited in the rear interior of the vehicle. The explosion was the result of the fire and heat coming into contact with the fuel tank. “This was an extremely strange occurrence that I have never observed or documented,” Oker’s report says. The injured firefighter at least recovered relatively quickly, according to the fire department’s press team. “He was checked out, but he got back to work in short order,” Minneapolis Fire Department Lt. Bryan Tyner, a department spokesman, tells ConsumerAffairs. Tyner confirms that the fire defied easy explanation. It’s not unheard of for cars to catch fire, even when they haven’t been in accidents. But those fires usually have something to do with an engine failure. As far as absurd car problems go, randomly catching fire and exploding is probably the worst thing that could happen, but safety groups say there’s a small but inherent risk that any vehicle could catch fire, even without a prior collision. Car safety groups are currently focusing on Kia and Hyundai vehicles, from the years 2010 through 2014, that they say have shown a pattern of catching fire while drivers are behind the wheel. One death has been linked to the alleged defect, but Kia and Hyundai executives have so far successfully dodged Congressional inquiries into the matter. Complaints of random fires in Toyota cars, by comparison, are more rare, but the Hans aren’t the first to warn of a Toyota fire that didn’t even originate in the engine. In fact, concerns that fires are igniting in the doors and windows of Toyota cars, including RAV4 vehicles, date back years. In 2012, the National Highway Traffic Safety Administration (NHTSA) began investigating complaints that fires were igniting on the driver’s side door in RAV4 cars and other Toyotas. At that time, ConsumerAffairs found 32 complaints submitted to officials describing fires that ignited from the driver’s side doors. One of the older complaints is strikingly similar to the complaint that the Han family filed with NHTSA more recently. 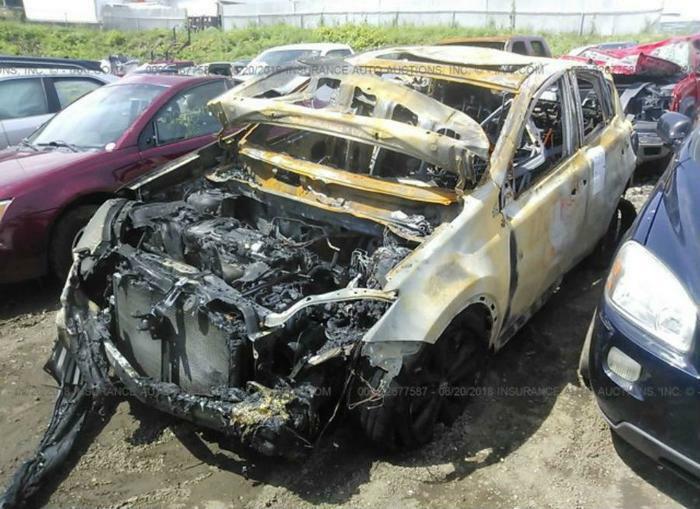 “In one case, a Toyota RAV4 caught fire while parked and unattended,” NHTSA’s 2012 case file reportedly said. Toyota eventually responded with a recall of 7.5 million cars and an announcement that a defect in the door switch could ignite fires in the affected vehicles. The announcement gave credence to drivers’ stories of finding their sleeves suddenly catching fire or their cars filling with smoke while they were driving. The recall at the time was the automaker’s largest since its previous sudden acceleration scandal, and Toyota was praised by experts for tackling this safety defect in a more timely manner. But three years later, a similar problem appeared to return, this time in the windows. In October 2015, Toyota announced it was recalling a total of 6.5 million cars over a defect in the window switches. The switches had the potential to short circuit and catch fire, Toyota’s announcement said. More recently, in late June of this year, Toyota’s Lexus brand announced a recall on 121,000 cars over a defect that it said could cause the fuel tank to leak and set the car on fire. In October, four months after the Hans’ RAV4 exploded, footage of another Toyota RAV4 burning and suddenly exploding made its way online. The footage, taken in Kenner, Louisiana, shows fire crews hosing down a RAV4 that is engulfed in flames on a highway. They are caught off guard when the car appears to explode, doubling the fire in size and nearly engulfing the two firefighters with it. But in that case, the driver told investigators that he believed that the fire was ignited by an object on the highway that he had driven over, not from the car itself, according to a police report obtained by ConsumerAffairs. After the Han family reported their own bizarre case in Minneapolis to their insurer and to the automaker, Toyota sent down an investigator to look into the issue. Toyota’s press team declined to discuss the case and said a letter that the company sent directly to the Hans speaks for itself. The Hans subsequently agreed to share that letter with ConsumerAffairs. Over five months later, the Hans’ boat is still unusable and their front lawn is still covered in glass. Their car insurer agreed to replace the damaged SUV, but it said the other damage wasn’t covered under the policy. It didn’t help the Hans’ case that Toyota claimed to find nothing defective in the manufacturing of its own vehicle. Several weeks after the explosion, Toyota sent an investigator down as promised. The following month, Toyota mailed the Hans a letter stating that the cause of the fire could not be determined because of the extent of the damage. But the letter also says that the aftermarket tow hitch had been installed incorrectly. “The [tow hitch] wiring was improperly routed along the vehicle’s undercarriage,” a Toyota claims specialist said in a letter to the Hans. “While the specific cause could not be determined, the modifications to the original electrical system could not be ruled out as a cause of the fire,” Toyota's letter concludes. "In all the years of installing trailer hitches I have never heard of such a thing happening, no I do not believe a trailer hitch could cause a vehicle to explode," Hank Scafer, the owner of the local towing company, says via email. Toyota’s letter to the Hans also downplays the explosion and the resulting damage and injuries that were documented by the Minneapolis Fire Department. “At 12:50 a.m., you heard popping sounds and found the vehicle was on fire. The fire department was called and responded to extinguish the fire,” is Toyota’s full account of what happened. Heap and Hayling don’t buy Toyota's suggestion that a tow hitch could have ignited the fire. Heap says he is planning to take Toyota to small claims court in an attempt to get money to fix his boat and grass-strewn front lawn. Still, the Hans opted to use what insurance money they did receive to buy the exact same car, a brand new RAV4 from 2018. Heap says he initially thought that Toyota would take more responsibility for what the couple believes was a car defect. The Hans even took their new RAV4 to the same tow hitch installer to show how confident they were that the towing mechanic wasn’t to blame. “My biggest regret was to give Toyota business again,” Heap now says. At the same time, even if it was a manufacturing defect that caused the couple’s first RAV4 to ignite, they figure that the chances of such a freak defect repeating itself are slim. “We felt that it was such a weird incident,” Heap says. "If this happens again, I should play the lottery." But they’re not ready to park the new RAV4 in front of their house. Instead, they park the new car down the street, near a man-made lake in the neighborhood, just to stay on the safe side. "We park it on the side where the boat used to be,” Heap says.